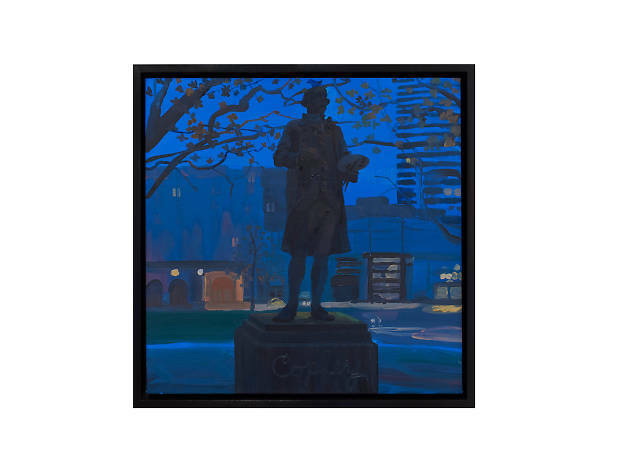 Modest in scale and tender in feeling, the dozen canvases in Daniel Heidkamp’s show relate scenes from a recent journey the Massachusetts native undertook from Boston to his current home in Sunset Park, Brooklyn. As depicted, the trip takes more of a wavy route than a straight line, making detours into emotion and memory that establish Heidkamp as a standout among a group of young, contemporary realists that includes Aliza Nisenbaum and Cynthia Daignault. 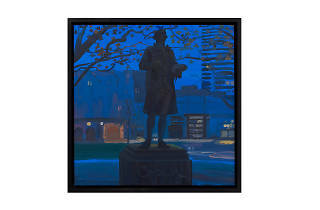 The series opens with an image of a statue honoring 18th-century American painter John Singleton Copley, swathed by deep-evening blue as it stands at dusk in the Beantown square bearing his name. It concludes with a view from Heidkamp’s studio of ferries plying the East River. These scenes don’t evoke beginning and end so much as they suggest the open and close brackets of a parenthetical in which digressions become the narrative. The wanderings yield gems like a pinkish monochrome of Heidkamp’s father bird-watching from his windowsill, and a house resembling Edward Hopper’s haunted manse by the railroad tracks—an interesting choice, since Heidkamp’s work more closely looks like that of Fairfield Porter, the critic and artist whose landscape paintings from the 1950s and ’60s offered a bucolic respite from the noise of AbEx and Pop Art. Heidkamp’s compositions possess the rambling, random-access quality of smartphone photos. Yet they also demonstrate that for all the power of recollection such devices offer at our fingertips, nothing equals the effect of experience rendered in paint.